Once a tax-free haven and the busiest seaport in the world, St. Eustatius was a wealthy Dutch outpost until the French occupation in the late 18th century, and the imposition of high taxes on merchants. The tiny island has a historical importance that surprises many visitors who arrive here, drawn by the offshore dive sites and rural landscape. 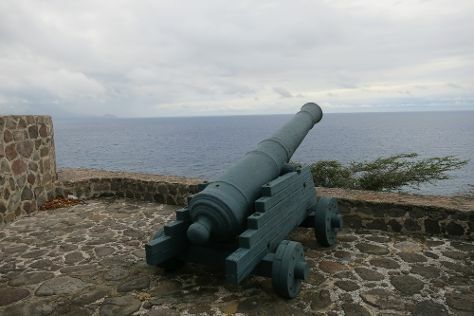 Reminders of the island's former grandeur and centrality to regional trade include forts and mansions, with sightseeing on St. Eustatius offering something different to a traditional island itinerary. St. Eustatius is in Caribbean. Find what you're looking for from your St. Eustatius holiday, by planning the whole thing with us using our handy St. Eustatius trip planner. Most accommodations on St. Eustatius line the streets of Oranjestad, the island's main settlement. Stay there to be close to shops, tourist attractions, and the island's airport. If you're looking for something a bit quieter, stay at one of the private rental apartments just east of Quill National Park.